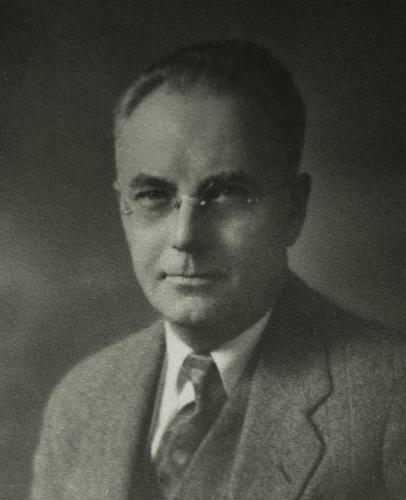 Hans Berg, born in 1881, was a native of Denmark and came to Grand Rapids when two years old. He was an independent furniture designer and had compiled a handbook on woodcarving, his hobby, which he learned at the John Widdicomb Co. His most famous work in Grand Rapids is the seventeen-foot carving in the Grand Rapids Public Library depicting events in Michigan history. It required 1,100 hours of carving. He was a member and past president of the Grand Rapids Furniture Designers Association, 1931, whose members spent many summer outings at his lodge, built on a large tract of land bordering the Muskegon River above the Hardy Dam. Mr. Berg died on May 29, 1954. Coll. 204-7, History & Special Collections Dept. Reproduction and copyright information regarding this image is available from Grand Rapids History & Special Collections, Archives, Grand Rapids Public Library, Grand Rapids, MI. Reproduction and copyright information regarding this image is available from Grand Rapids History & Special Collections, Archives, Grand Rapids Public Library, Grand Rapids, MI.